Dr. Katherine Schneider likes to celebrate big birthdays with big projects. It started with her 60th, for which she organized a fundraiser potluck to raise money for the pet food delivery program she founded in 2006, We All Love Our Pets. When Schneider turned 65, she funded and initiated the creation of a statue to honor service animals outside the Centennial Hall at UW-Eau Claire in 2014. 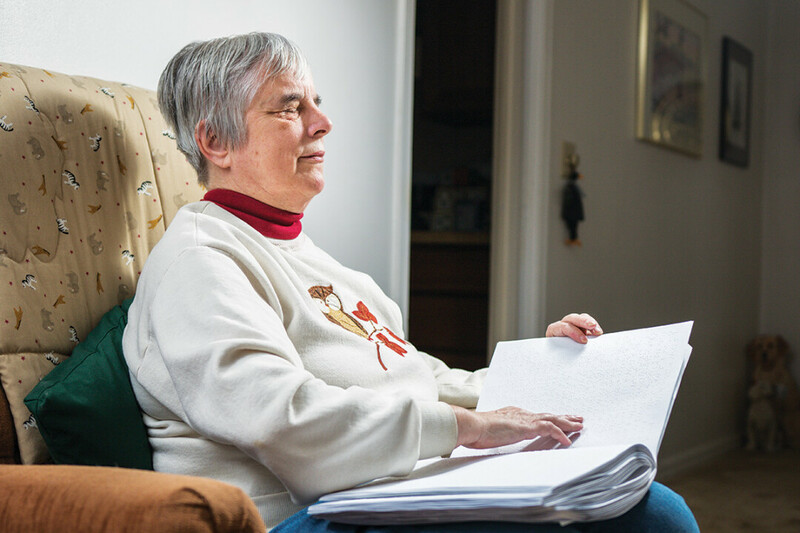 As she approaches her 70th birthday, she is working on publishing a book of poems in braille. Several stacks of news publications sit just inside Schneider’s front door, some nearly as tall as she is, waiting to be read. She’s always been a voracious reader, following knowledge from the stories her mother read to her when she was a child through a Ph.D. from Purdue University to a career in psychology. She is a regular churchgoer and book club member who quotes Bible verses and condemns The Great Gatsby on her personal blog. People used to tell Schneider, senior psychologist emeritus for UW-Eau Claire, that retirement is busier than employment. She left her position with the university in 2004, and found the analysis fair – she refers to retirement as a full-time job. Schneider has doubled down on her commitment to disability advocacy since then, founding and working on dozens of projects to improve accessibility and make the Eau Claire community, and the world, a better place. “I kind of look around at the world to see where is there's a gap,” Schneider said. “Where is there something that isn’t happening? Where aren’t people with disabilities represented?” This question has led her to publish three books about disability: two memoirs detailing her own experience with blindness, and a children’s book that offers advice and resources for young people with disabilities. She serves on community boards, reads poetry at senior homes, and sponsors a lecture series at UW-Eau Claire. About one in five people in the United States lives with a disability, according to the U.S. Census Bureau. One in two people 65 years or older have a disability. Schneider has always aimed to live that philosophy by being a helping hand to others. She worked with the Eau Claire Community Foundation to establish a fund to support nonprofits’ efforts to serve people with disabilities. This program has assisted in funding the hire of a translator to relay a first aid class to deaf people using American Sign Language. She worked with the L.E. Phillips Memorial Public Library to install and test a braille printer this year. When the World Series for Beep Baseball, a version of the sport that can be played by people who are visually impaired, took place in Eau Claire at the end of July, she trained hotel staff in blind etiquette and worked with organizers to ensure welcome bags included items that could be enjoyed by all participants. Schneider also works to improve representation of disability in writing. In her children’s book, Your Treasure Hunt, she shares a memory of her elementary school classmates laughing at a story they read about seven blind men who went to see an elephant. This, besides accounts of Helen Keller and Louis Braille, is the only story she can remember that included blind characters, and it is not one she remembers fondly. She and her family endowed the Schneider Family Book American Library Association Award in 2003 to celebrate the increase in representation in children’s literature that has taken place during Schneider’s life. Representation in literature is important to children with disabilities, Schneider said. But she stresses that it’s necessary to write such characters with as much depth as those written without disabilities. “The disability experience in these wonderful children’s books is a part of a character’s full life, not the focus of the life,” the award submission manual states. “Every year the judges say they get more and more books to judge, so that’s working,” Schneider said. Schneider established the Katherine Schneider Journalism Award for Excellence in Reporting on Disability in 2013 to combat the cringe. The award is given annually with a cash prize by the National Center for Disability in Journalism at the Walter Cronkite School of Journalism. The success of these awards, and their positive impact on representation, “makes her heart happy,” she says. Schneider has always strived for excellence in her academic achievement, in her work, and as an advocate for herself and others. In a recent blog post, she mused about her lifetime of hard work, informed by her parents’ work ethic and the necessity to overcome the challenges presented by a world ill-equipped to accommodate blindness. It’s all in an effort to leave the world a better place than she found it. However, while working comes easily to her, she says learning to play has been a lifelong adventure. It’s her service dog, Luna, who often reminds her to play. The small, polite, 8-year-old Labrador Retriever – Schneider’s ninth service dog – initiates play by rolling over for belly rubs or pounding the floor with her paws in play posture to initiate a game of chase. “They remind me there’s nothing more important to do right now than celebrating the goodness of just being alive,” she wrote.